Last month, I covered some of our social media statistics. For this post, I’m going switch gears and take a quick look at website statistics. Over a recent one-year period (1 Sept. 2012 – 31 August 2013), the global system of UNU websites — or at least those with Google Analytics installed and integrated into the Office of Communications monitoring system — received 7.40 million pageviews by 3.04 million visitors. 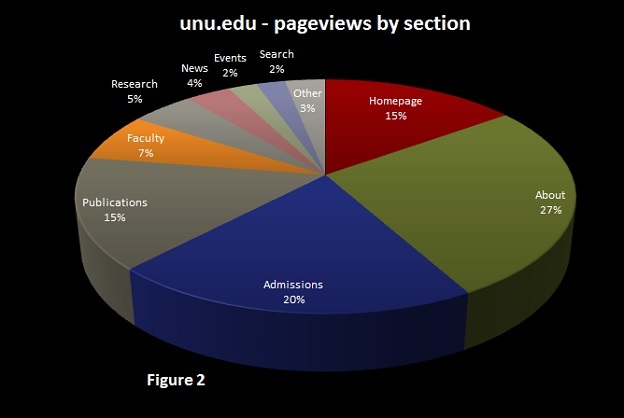 The most visited site was the main unu.edu website, which garnered 2.11 million pageviews (809 thousand visitors). The second-most-visited site, I was initially surprised to note, was our archive site (the old version of unu.edu, which has not been updated since April 2011). A closer examination, though, shows that of the 1.09 million pageviews (708 thousand visitors) received by the archive site, more than 90% were people looking for the free, online, full-text versions of the several dozen older UNU press books that are accessible on the archive site, or looking for the 1978–2006 issues of the Food and Nutrition Bulletin that also are archived there. Rounding out the top five global UNU websites for the Sept. 2012 to Aug. 2012 period were the UNU-MERIT website with 839,336 pageviews (216 thousand visitors), the UNU-WIDER website with 754,361 pageviews (215 thousand visitors) and the OurWorld2.0 webzine with 595,958 pageviews (374 thousand visitors). The front page was viewed 315,174 times (14.9% of total pageviews). Pages in the About section were viewed 583,599 times (27.6% of all pageviews); the most-viewed subsections of the About section were Employment (6.7%), About UNU (6.0%), Internships (5.8%), and The UNU System (3.0%). Pages of the Admissions section were viewed 422,176 times (20.0% of all pageviews); the most- viewed subsections of the Admission section were Master’s Programmes (6.7%), Doctoral Programmes (4.1%), and Non-Degree Courses (3.8%), and Scholarships & Funding (1.3%). Pages of the Publications section were viewed 320,217 times (15.2% of all pageviews), with the most viewed subsections being Articles (8.6%) and Books (4.8%). Pages of the Faculty section were viewed 139,830 times (6.6% of all pageviews). Pages of the Research section were viewed 101,207 times (4.8% of all pageviews). Pages of the News section were viewed 72,725 times (3.4% of all pageviews). Pages of the Events section were viewed 47,214 times (2.2% of all pageviews). Search results pages were viewed 46,958 times (2.2% of all pageviews). So, what does it all mean? I’ll save my conjectures for a subsequent post — but in the meantime, feel free to jump in with your own speculations via the Comments area below.